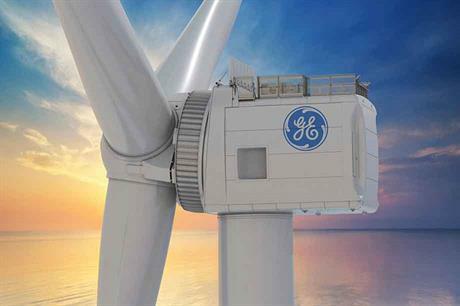 These figures, and other details, of GE’s new direct-drive offshore turbine, were revealed by a Windpower Monthly investigation of the environmental and technical information GE had to submit as part of the permitting process. The information is publically available on the Dutch government website Overheid.nl. The prototype will be installed close to SIF’s offshore turbine foundation plant at the Maasvlakte 2 extension of the port of Rotterdam. According to the documents, it will have a hub height of 135 metres and a tip height of 245 metres. GE will also install a single met mast along with the turbine, also with a maximum height of 135 metres, to conduct wind measurements. The turbine foundation is based on a four-metre high coning concrete slab with a 28-metre diameter, supported by 48 round piles, each measuring 65cm in diameter, according to a company document containing the structural principles of the prototype and foundation works for the turbine and met mast. This concept was chosen because the prototype site is on reclaimed land, created in 2013 with dredged material. Specific details on the Haliade-X’s main technical specifications were prepared by Dutch consultancy Pondera Consult, contained in an additional document. Bigger turbines, according to the infamous Square Cube Law (SQL), become inherently heavier with size increments. The Haliade-X's 600-tonne nacelle mass, plus 165 tonnes for the blades, and an estimated hub mass of 60 tonnes, adds up to a head mass of 825 tonnes. This translates to a specific mass of 68.8 tonnes per megawatt (68.8T/MW) for a 12MW rating. The Vestas V164-8MW, by comparison, brings about 62.5T/MW to the scales, and Siemens Gamesa's SWT 7.0-154 around 51.4T/MW. The Haliade-X operates at a 7.81rpm rated speed, resulting in a modest 89.2m/s rated tip speed. This reflects the wind industry’s hesitance to raise offshore tip speeds to higher levels, despite the predictions of some leading experts about a decade ago that this would inevitably happen as noise is not a main issue offshore. An engineering drawing of the Haliade-X’s front and side projections shows a rotor diameter of 218.2 metres, which notably differs from GE’s officially communicated figure of 220 metres. The smaller rotor results in a 321W/m2 specific power rating for a 12MW turbine, and 374W/m2 for a 14MW rating. By comparison, the specific power ratings of the Siemens Games SG8.0-167 and the MHI Vestas V174-9.5MW are 365W/m2 and 400W/m2 respectively. The recently announced SG 10.0-193 scores 342W/m2. Drivetrain engineering-drawing inserts of the box-type nacelle show a six-degree drivetrain tilt, and inclined pitch bearing/blade assembly mounted on a compact-design hub, and substantial blade pre-coning. All three design measures have become state-of-the-art for large-scale upwind turbine rotors, and are aimed to prevent the blades striking the tower during gusty high-wind conditions. The drawing inserts further show that the direct-drive PMG’s outer diameter roughly matches the nacelle’s 11-metre width. The exposed outer generator surface incorporates ribs, which suggests a "conventional" inner-rotor generator, whereby the stator is exposed to natural airflow over the nacelle for enhanced heat dissipation performance. An important question is whether the "pure torque" principles applied in the direct-drive GE Haliade 150-6MW, have been re-applied to the Haliade-X. This unusual solution aims to prevent rotor-induced bending moments entering the generator-rotor. Such non-torque loads could negatively impact generator shape retention and overall structural integrity through exposure to continuously changing combinations of mechancial, electrical and thermal loads. On the 6MW Haliade, the rotor hub rotates at a stationary shaft (axle pin) and rotor-bending moments pass directly via the main carrier into the tower. Rotor torque is finally transferred via flexible torque arms from the hub to the generator-rotor, which turns at its own bearing. The combination could potentially allow a smaller air gap and higher generator efficiency. The coning generator front in the drawing could allow some of the extra space required for incorporating pure torque. The full answer probably lies in a GE illustation showing three box-type 120-degree interspaced structures between hub and generator, accommodating the hub-generator torque arms interface. The nacelle’s elevated frontal upper section could finally provide optimised internal service access to the generator, and it accommodates the rooftop cooler behind the rotor.